"Bucharest Airport" redirects here. For other uses, see Bucharest Airport (disambiguation). The National Company "Bucharest Airports" S.A.
During World War II, the airport in Otopeni was used as an airbase by the German Air Force. Until 1965, it was a major airfield for the Romanian Air Force, with Băneasa Airport serving as Bucharest's commercial airport. In 1965, with the growth of air traffic, the Otopeni airbase was converted to a commercial airport. The runway was modernized and extended to 3,500 metres (11,500 ft) from the previous 1,200 metres (3,900 ft), making it one of the longest in Europe at that time. In August 1969, when United States President Nixon visited Romania, a VIP lounge was inaugurated. A new passenger terminal (designed by Cezar Lăzărescu), with a capacity of 1,200,000 passengers per year, was opened on 13 April 1970, for domestic and international flights. An improvement program added a second runway in 1986, expanding capacity to 35 aircraft movements per hour. In 1992, Otopeni Airport became a regular member of Airports Council International (ACI). The first stage of the plan (Phase I), taking place between 1994 and 1998, involved the construction a new departures terminal and of a new airside concourse with five jetways and nine gates (referred to as 'the Finger') as well as the extension of airport ramps and of their associated taxiways. The second phase (labeled Phase II/IIe) of the plan led to the construction of a terminal dedicated to domestic flights and of a multi-story car park (2003), the complete overhaul of the control tower (between 2005–2007) as well as the transformation of the old terminal building in a dedicated arrivals hall (in 2000). During the same phase, two high-speed taxiways (Victor and Whiskey) were constructed. Phase II was completed in 2007. The third stage of the plan (Phase III), which started in 2009, involved the extension of the airside concourse ('the Finger') with 15 new gates (nine of which have jetways), as well as the expansion of the Departure Hall (with 8 new gates). The airside concourse extension, designed by Studio Capelli Architettura & Associati, and measuring 17,000 square metres (200,000 sq ft), was inaugurated on 29 March 2011. It was followed, in November 2012, by the extension of the Departure Hall to a total area of 38,600 square metres (400,000 sq ft). In March 2012, all air traffic except for business air traffic was transferred from Aurel Vlaicu International Airport (at that time Bucharest's low-cost hub) to Henri Coandă International Airport. The airport's facilities consist of a single terminal with three main facilities (colloquially referred to as "Terminals"): the Departures Hall/Terminal, the Arrivals Hall/Terminal, and the Finger Terminal (the airside concourse). A walkway with shops connects the departures and arrivals buildings. The airside concourse is organized in two (domestic and international) passengers flows. The entire terminal has 104 check-in desks, 38 gates (of which 14 are equipped with jetways), and a total floor area of 86,000 square metres (930,000 sq ft). Beyond Phase III, a new terminal building (Henri Coandă 2) at the eastern end of the current location is envisaged. Henri Coandă 2 will be of a modular design, consisting of four separate buildings, each capable of handling 5 million passengers annually. Each module will be built as traffic demands dictate. By 2030, Terminal 2 alone should be able to handle the expected volume of 20 million passengers per year. The terminal will be directly connected to the A3 motorway, to the railway system, and to the Bucharest Metro system through Metro Line 6. However, the plans might get delayed due to funding problems. There is a chance however that, if funds can be allocated in time, the airport can open its new terminal by 2030. In 2018, 13,824,830 passengers passed through the airport, an increase of 7.95% compared to 2017. A direct train service to the main railway station, Gara de Nord, runs from the Airport railway station, about 900 meters from the airport. Shuttle buses connect this station with the departures and arrivals halls; the tickets are valid for the train and for the transfer bus. The next phase of the expansion aims to locate the train station in the airport itself. By 2025, Bucharest Metro Line M6 should open, connecting the airport to the Gara de Nord (Bucharest North) train station, and integrating the airport into the Bucharest Metro network. Henri Coandă Airport is connected to the public transport company STB system. The 780 route provides express bus service to Gara de Nord and Gara Basarab railway stations in Bucharest, and the 783 route provides express bus service to the city center (Piața Unirii). The airport is 16.5 km (10.3 mi) north of central Bucharest, to which it is connected by route DN1. The A3 motorway will connect the future terminal 2 and the city. As of May 2013, taxis serving Henri Coandă Airport can be ordered using a touch screen system in the arrivals terminal, allowing the taxi drivers to enter the pick-up area. This measure was taken after many complaints from passengers who were being ripped off when using illegal, high-price taxis. Uber and Taxify are also available at the airport. On 31 March 1995, TAROM Flight 371, an Airbus A310-324 registered as YR-LCC, stalled after take off and crashed near Baloteşti. All 60 people aboard were killed. ^ a b "EAD Basic – Error Page". Retrieved 3 June 2015. ^ "Bucharest Airports - Bucharest Henri Coandă International Airport - Bucharest Henri Coandă International Airport". www.bucharestairports.ro. ^ "Contact." Henri Coandă International Airport. Retrieved on 1 December 2011. "The National Company "Bucharest Airports" S.A. Calea Bucurestilor nr. 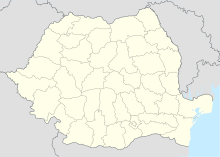 224 E Otopeni, Ilfov County Postal code 075150 Romania" – Address in Romanian: "Compania Națională "Aeroporturi București" S.A. Calea Bucureștilor nr. 224 E Otopeni, județul Ilfov Cod postal 075150 România"
^ a b c d e "Charter programme". kusadasi.ro. ^ "Air Canada Expands its Global Network from Montreal with New Service to Bucharest, Romania and Lisbon, Portugal". www.newswire.ca. ^ name="aircanadarouge"> "Air Canada Rouge Inaugurates Bucharest From Montreal and Toronto,". ca.travelpulse.com. ^ Arkia. "Arkia Israeli Airlines - Flights to Tel Aviv, Eilat Packages, Hotels in Israel". www.arkia.com. ^ "Croatia Airlines schedules new routes in S17". Routesonline. Retrieved 6 March 2017. ^ "SAS Makes Your Travel Easier". www.flysas.com. ^ NewAgeLab. "WindRose. Airline tickets. Book and Buy online. Ticket". windrose.kiev.ua. ^ "Wizz Air announces three new routes from Liverpool to Romania". Liverpool John Lennon Airport. ^ a b c d "Anna.aero database". Retrieved 25 May 2017. ^ "Home - Eurostat". ec.europa.eu. ^ "Bucharest Airports – Bucharest Henri Coandă International Airport – Train connection". Retrieved 3 June 2015. ^ Chirileasa, Andrei (2015-04-29). "Romania finances subway extension with money from emissions trading". Romania Insider. Retrieved 2017-09-19. ^ "Bucharest Airports – Bucharest Henri Coandă International Airport – Bus". Retrieved 3 June 2015. ^ "Touch screen installed for cab ordering at Otopeni airport in Bucharest". Romania Insider. Retrieved 2 May 2013. ^ "15 ani de la cea mai mare catastrofă aeriană din istoria României". Adevărul. 31 March 2010. Archived from the original on 24 December 2010.